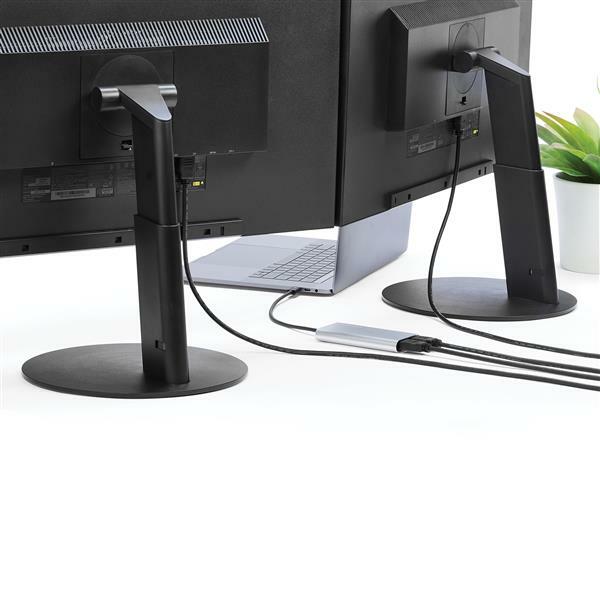 This high-performance Thunderbolt™ 3 adapter lets you add two 4K 60Hz HDMI monitors to your Windows® or Mac computer through a single Thunderbolt 3 port. The Thunderbolt video adapter is compatible with computer systems that support Thunderbolt 3, such as models of MacBook Pro, Dell™ Precision and Dell XPS. 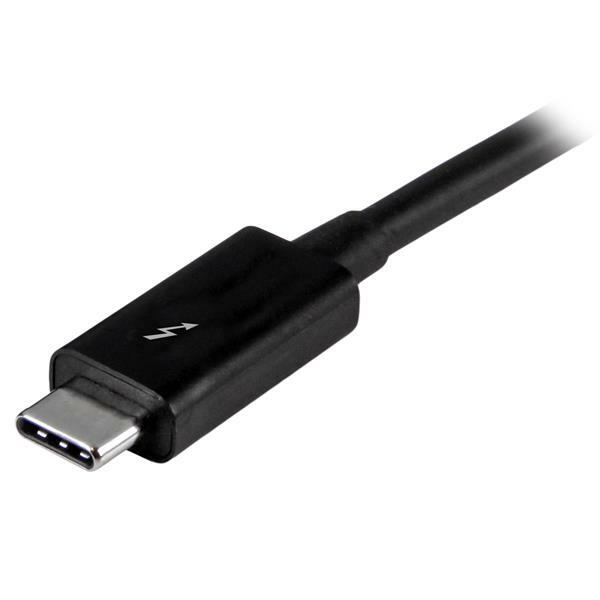 Thunderbolt 3 is a protocol that uses the USB-C™ connector, but your computer system must support Thunderbolt 3 in order for the adapter to function as expected. If you connect the adapter to a USB-C port that does not support Thunderbolt 3, the adapter will not function. With an unprecedented 40Gbps of throughput, Thunderbolt 3 enables you to achieve the previously impossible feat of using a single port on your laptop to output dual 4K resolution at 60Hz to two independent displays. This performance lets you run the most resource-demanding applications imaginable. You can output independent content to each display at resolutions of up to 4096 x 2160p (60Hz), which is perfect for editing 4K video or performing other Ultra HD tasks such as creating CAD drawings or reviewing medical imagery. 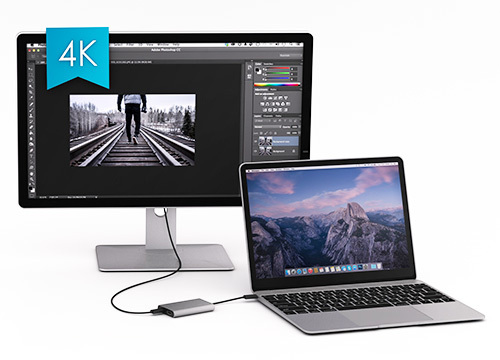 Functioning as an external 2-port graphics adapter with audio support, this is a compact and convenient alternative to a laptop dock when you don’t need full docking capability. With two UHD 4K displays, you can work more efficiently from your laptop, so you can accomplish more in the same amount of time. With each display delivering 4K performance, you can have four times the screen space compared to 1080p. Creative professionals can be more productive with the freedom to edit 4K video on one display while previewing raw video playback on the second 4K display. This adapter helps to keep your system running at peak performance. Unlike USB external video solutions, Thunderbolt 3 lets you run Ultra HD 4K resolution at 60Hz on both displays without draining system resources. 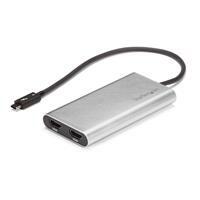 Because it’s backward compatible with your high-definition 1080p displays, this is a great accessory for home, office or other desktop workspace applications. The TB32HD24K60 is backed by a 2-year StarTech.com warranty and free lifetime technical support. The required updates will vary depending on your computer. For an up-to-date list of affected computers and instructions, visit http://thunderbolttechnology.net/updates. If your manufacturer isn’t listed on the Thunderbolt website, contact your manufacturer. Note: In order to connect to two displays at 4K 60Hz, your computer system must have a fully enabled Thunderbolt 3 port that supports up to 40Gbps or the host must support dual displays over Thunderbolt 3. Note The adapter will only function when connected to the Thunderbolt 3 port of your computer. If the port is a USB-C port that does not support Thunderbolt 3 the adapter will not function. Total bandwidth up to 40Gbps. Data transfer speeds are dependent on the other features that you are using in your setup. USB 3.1 Gen 2 support. 4K 60Hz video on one or two separate displays. 5K 60Hz video on a single display. A 10 GbE network connection between two Thunderbolt 3 compatible computers. Up to six devices daisy-chained from a single Thunderbolt 3 port. Alternate modes, such as DisplayPort Alternate Mode (DP Alt Mode). Bi-directional power delivery up to 100W (not all Thunderbolt 3 devices support power delivery). Thunderbolt 3 uses the USB-C connector, but not all host connections, cables, and devices with a USB-C connector support Thunderbolt 3. This means that a USB-C device is compatible with a Thunderbolt 3 host connection, but a Thunderbolt 3 device is not compatible with a USB-C host connection. Therefore, it is important to know whether you have a USB-C or a Thunderbolt 3 host, cable, or device. To determine if your component is a Thunderbolt 3 device, look for the Thunderbolt 3 symbol (shown below). USB-C devices do not include this symbol. For more information about USB-C, see the following FAQ: https://www.startech.com/faq/usb-c-port-capabilites. If you use an adapter, Thunderbolt 3 host connections are compatible with Thunderbolt 1 and Thunderbolt 2 devices. You can use the StarTech.com TBT3TBTADAP to make a Thunderbolt 3 host connections backwards compatible. Thunderbolt 3 devices are not backwards compatible with Thunderbolt 1 and Thunderbolt 2 host connections. How can I tell if I have a USB-C or Thunderbolt 3 port? To determine if your component is a Thunderbolt 3 device, look for the Thunderbolt 3 symbol (shown below). USB-C devices do not include this symbol. For more information about USB-C, see the following FAQ: http://www.startech.com/faq/usb-c-port-capabilites. Can I use this device to increase the maximum number of displays that my video card supports? No, you cannot use this device to increase the maximum number of displays that a video card supports. For example, if your video card only supports up to three displays and you add this device to your setup, your display limit is still three displays. If you have connected more than one of this device to the same computer and are experiencing display issues, you should make sure that your video card can support the number of displays that you are using in your setup. Are there any known incompatibilities with this device? This device requires that the Thunderbolt 3 host system provides 15W of bus power to the Thunderbolt 3 port. Thunderbolt 3 host systems that do not provide the full 15W of bus power will not work with this device. Refer to the information provided by the manufacturer to confirm the power delivery capabilities of your host system. How do I check which version of Thunderbolt 3 software, firmware, and drivers I am running in Windows? Type Thunderbolt and click on the search result. In the system tray, right-click the Thunderbolt icon. Review the versions of the software package, NVM firmware, PD firmware, and drivers. If you are not running the latest versions, navigate to the manufacturer’s website and download the latest versions. When I connect my Thunderbolt 3 device to my Windows computer, I get pop-up messages. What do I do? In the New Thunderbolt devices have been attached pop-up message, click OK. In the User Account Control pop-up message, click Yes. If you want to authorize your Thunderbolt devices every time that you connect them, select Connect Only Once in the drop-down list. If you want to authorize your Thunderbolt devices only once, select Always Connect in the drop-down list. If you accidentally set your Thunderbolt device to Do Not Connect in step three above, refer to the following FAQ: https://www.startech.com/faq/thunderbolt-3-denied-authentication. What do I do if I accidentally set my Thunderbolt 3 device to Do Not Connect and it stops working? Select the Thunderbolt 3 port that you want to authenticate. How do I manage my authenticated Thunderbolt 3 devices in Windows? Use the cable, video adapter, video source, and video destination in another setup to see if the problem is with the components or the setup. Use a different cable, video adapter, video source, and video destination in your setup to see if the problem persists. Ideally, you should test a component that you know works in another setup. Remove the video adapter from your setup and test to make sure that the video source and video destination work together without the video adapter. Note: In order for your setup to work properly, the video source, adapter, and destination all need to support the resolution that you are using. My computer is not properly detecting my Thunderbolt 3 device. What do I do? Update the Thunderbolt software on your Thunderbolt 3 host device. Update the Thunderbolt controller NVM firmware on your Thunderbolt 3 host device. Update the Thunderbolt controller drivers. Update your motherboard BIOS or UEFI. For more information about how to update the software, firmware, drivers, and BIOS or UEFI, refer to the website of the manufacturer of the Thunderbolt 3 host device. The following website includes links to some of the manufacturers of Thunderbolt 3 host devices: https://thunderbolttechnology.net/updates. If the manufacturer of your host device is not listed, you should contact the manufacturer or refer to their website for more information. For more information about how to check which version of the Thunderbolt software and firmware you are currently using, see the following FAQ: https://www.startech.com/faq/thunderbolt-3-check-software-firmware. For more information about Thunderbolt 3 host system and motherboard compatibility, refer to the Thunderbolt 3 Compatibility and Troubleshooting guide. What do I do if I can only get a single display to work with my Thunderbolt 3 device? If you are only getting a single display to work with your Thunderbolt™3 device, make sure that your Thunderbolt 3 host device can support two separate DisplayPort lines over Thunderbolt 3. While Thunderbolt 3 supports dual monitors over a single connection, not all Thunderbolt 3 host devices are designed to meet this requirement. If your Thunderbolt 3 host device does not meet this requirement, you cannot troubleshoot this issue with software, firmware, or driver updates, and you cannot use this device to achieve dual displays over Thunderbolt 3. If you are not sure whether your Thunderbolt 3 host device supports dual monitors, contact your Thunderbolt 3 host device manufacturer. If you confirmed that your Thunderbolt 3 host device does support dual monitors and you are only seeing a single display, see the following FAQ: https://www.startech.com/faq/thunderbolt-3-update-software-firmware. I received an error message stating that the Thunderbolt device I’m using is not certified for PC use. How do I resolve this issue? Type Thunderbolt and click the search result. 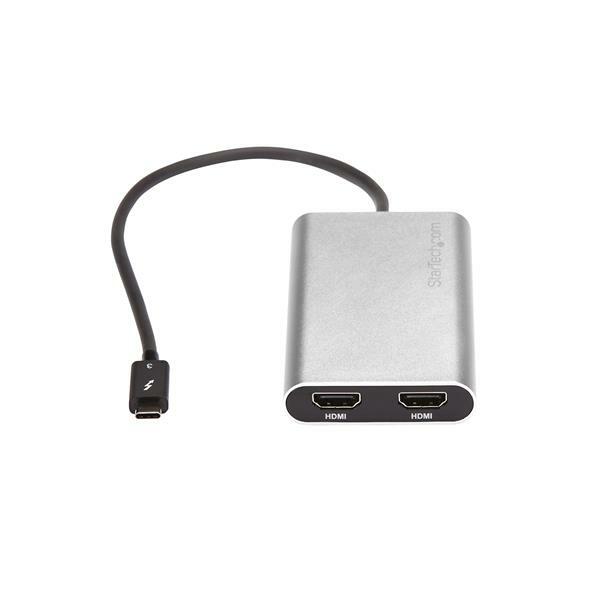 Clear the Only allow Thunderbolt Devices that have been certified for PC check box. My DisplayPort displays are not working at 60Hz with this adapter. How do I resolve this issue? To use a Thunderbolt 3 adapter to output to a display at 60Hz, your monitor must support the refresh rate and you need to set the monitor to work at 60Hz. By default, most monitors are set to DP1.1, which will not work with this Thunderbolt 3 device when you use a display at 60Hz. In most cases, you need to set your monitor's DisplayPort settings to DP1.2. To resolve this issue, use the buttons on your monitor to change the DisplayPort settings to DP1.2. For more information about changing your monitor settings, refer to the website of the manufacturer of your monitor. My DisplayPort display is not working when I try to output 4K at 30Hz with this device. How do I resolve this issue? To output 4K to a DisplayPort display at 30Hz, your monitor must support the resolution and refresh rate. If your monitor also supports 4K at 60Hz (DP 1.2 or higher), you may also need to set the monitor to work at 30Hz. To resolve this issue, use the buttons on your monitor to change the DisplayPort settings to DP1.1. For more information about how to change your monitor settings, refer to the website of the manufacturer of your monitor.